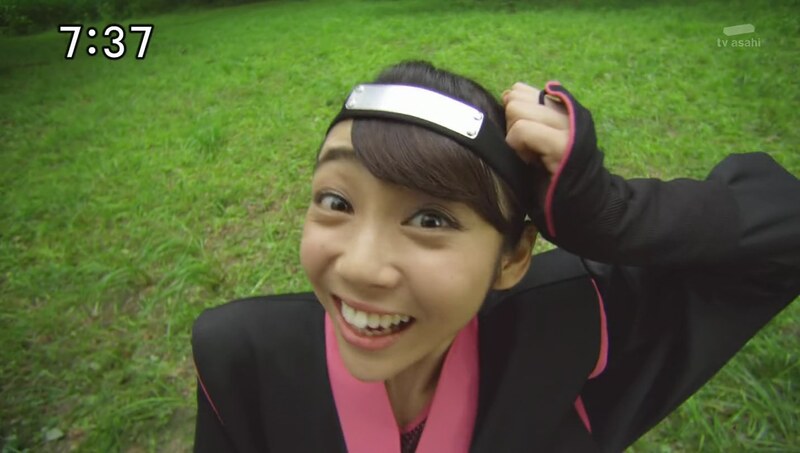 Recap: Shuriken Sentai Ninninger, Episode 31 – Ninjas on the Run! The Ninningers are training at the dojomanse by sparring with each other. Nagi decides to use Advanced Ninpou and tries a Hot Bath technique against the others. But it only plops them into a relaxing bathhouse. Yakumo, Fuuka and Kinji work together on an Advanced Ninpou Hot Pot Technique which plops Nagi into the soup. Meanwhile, Kyuuemon brings Ninja Mujina to life to help him with his plan. Kasumi watches Nagi training alone in the forest and says he must have taken a hit to his ego earlier. Nagi says he must have become too complacent after being the first one to get the hang of Advanced Ninpou. Anyway, catching up to the others is one of his best qualities, so he’s not worried. Kasumi says that it’s fine to play catch up, but it’s also good to be a step ahead, especially in the Last Ninja race. Nagi welcomes Kasumi’s suggestion to train together. But Mujina appears and wants to play. Nagi and Kasumi henge. Mujina tosses them around and is about to use a Specialty Steal Technique on Nagi. But Kasumi pushes him out of the way the technique is used on her instead. The others arrive and while Mujina wants to play some more, Kyuuemon stops him and they leave. Kasumi has dehenged and the others ask if she’s okay. But much to their surprise, she happily says she has no clue. Ariake no Kata has just returned from the spa, but is upset when Kyuuemon says they don’t have much fear. Mujina, however, explains what he took from Kasumi: her specialty or individuality. Back at the dojomanse, Nagi explains what happened and the Ninningers realize Kasumi is not her usual analytical self. They meet with Mujina who suggests they play Ninja Keep Away. If they are able to take the ball, Kasumi’s specialty, they win. But if they lose, then he’ll take their specialties as well. The Ninningers henge and the game begins. Mujina hands the bag with Kasumi’s specialty to a Supparage who runs off. Yakumo and Kinji run after the Supparage. But Kasumi, who has just fallen into one of her own pitfall, calls Yakumo to come help. Yakumo hurries over and finds Kasumi who seems perfectly fine. She runs over and gets on top of him. Turns out this is actually Mujina who now takes Yakumo’s specialty. Kasumi and Yakumo are put in a cage. Yakumo tries to use his magic, but it doesn’t work. It appears magic is Yakumo’s specialty. Takaharu thinks he has cornered the Supparage with the bag, but Mujina pops in and takes his specialty. Takaharu joins the cage pair and is now longer his hot self. Mujina announces Yakumo and Takaharu have been captured, so Kinji, Nagi and Fuuka come up with a plan. Kinji disguises as a Supparage and manages to get the real one to toss the bag to him. They head back and fight off the Supparage guarding the cage. Mujina stops Kinji and takes his specialty. Fuuka tosses Kasumi’s specialty in the air for Nagi to hit towards her in the cage. 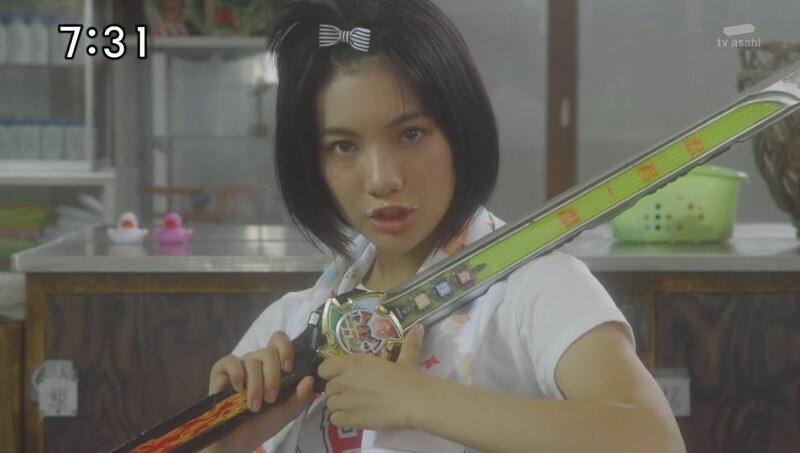 But Kasumi bends down and her specialty instead goes to Takaharu. 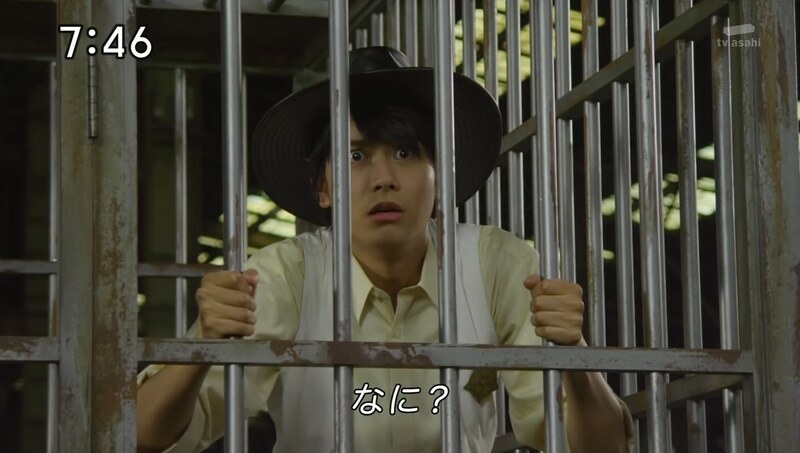 Takaharu gets out of the cage while Kasumi points out Kinji’s specialty is his weird Japanese. 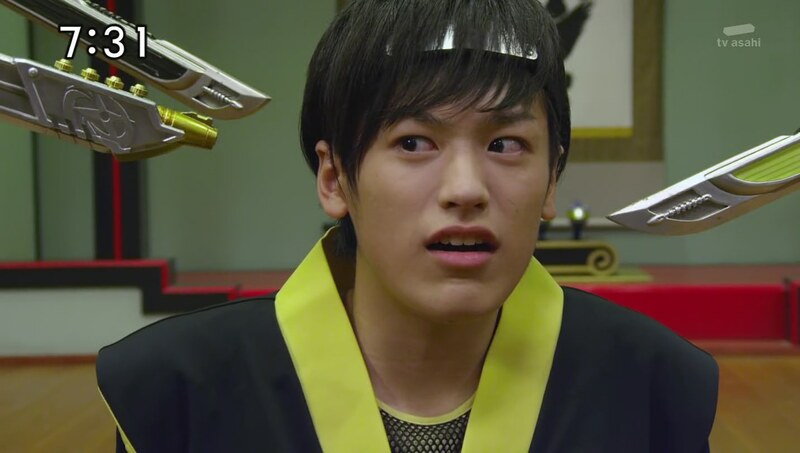 Takaharu poofs him, Nagi and Fuuka away to figure out another plan. 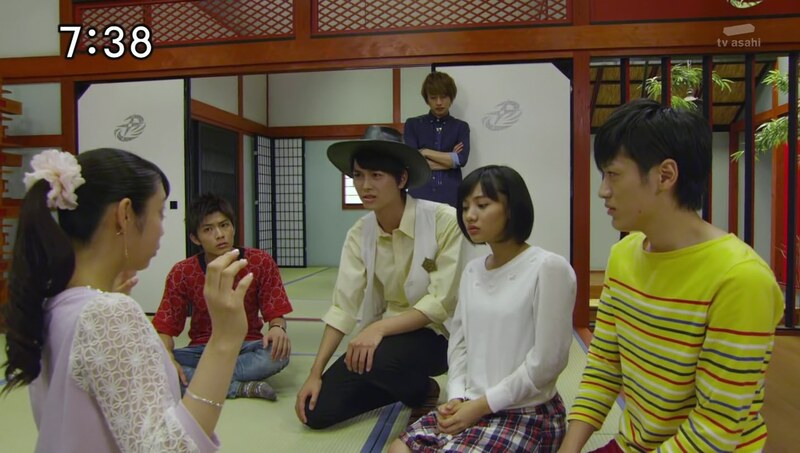 Nagi and Fuuka marvel at Takaharu with Kasumi’s brains. But Nagi remembers Kasumi’s words earlier and they come up with an idea. Mujina chases Fuuka to the lake. 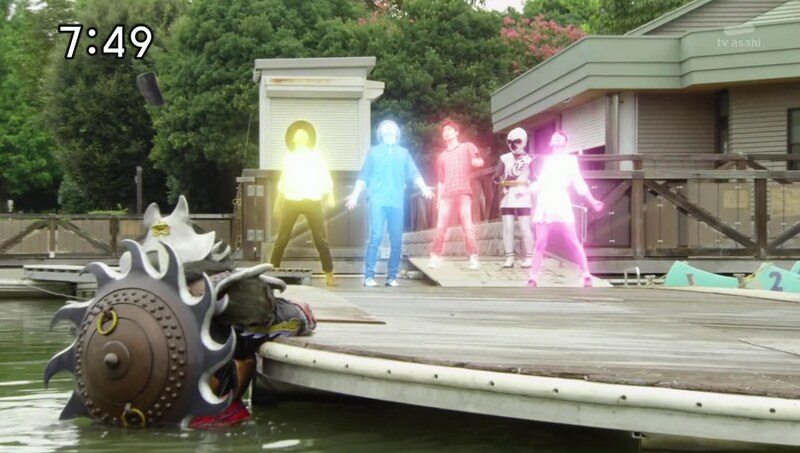 Takaharu is waiting inside a boat already on the water and Mujina runs over to him. He takes the specialty and Takaharu returns to the cage. But Fuuka is there as well and takes the key from the Supparage. Nagi, meanwhile, surprises Mujina as he’s been in the boat the entire time by using Advanced Ninpou to combine with it. Nagi is able to take the pouch with everyone’s specialty. The others arrive and Nagi tosses them their specialty back. They all henge and take on Mujina. A Chozetsu Takaharu and Nagi team up to deliver a Double Shuriken Slash to finish off Mujina’s first life. Kyuuemon is fine with it since this seems to be all part of his plan. He embiggens Mujina and the Ninningers hop into Ha-Oh ShurikenJin. And with it, they are able to quickly finish off Mujina for good. 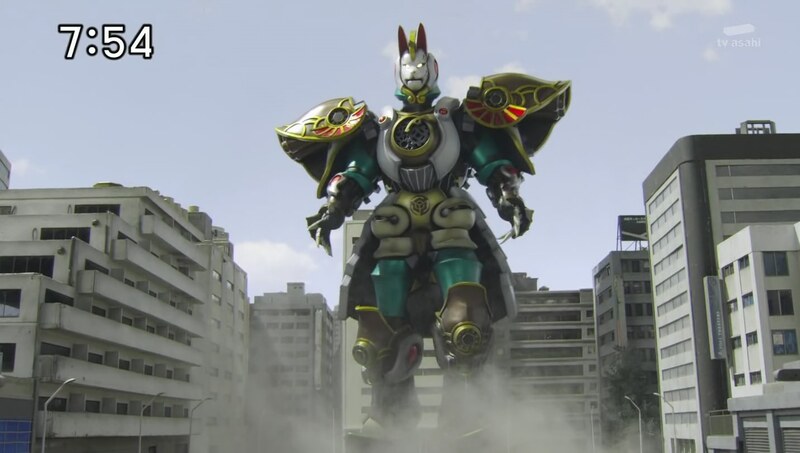 Kyuuemon now has four Ninja Core Gears which he uses to power his own OtomoNin: Karakuri Kyubi. The Ninningers attack, but they have no effect. Shishioh is just as shocked. Kyuuemon initiates a Kogitsune Ranbu attack of little fox pods which forces Ha-Oh ShurikenJin to separate. Neither ShurikenJin nor Bison King can even leave a scratch on Karakuri Kyubi. Kyuuemon slashes at them and they all uncombine. 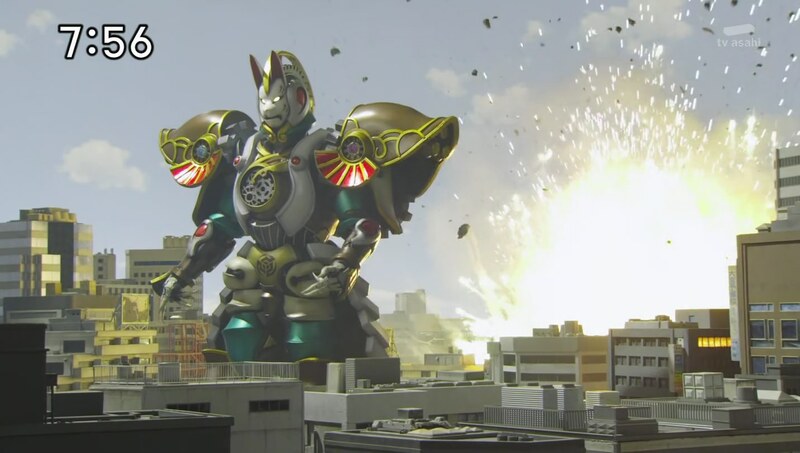 Takaharu takes Lion Ha-Oh and tries to attack, but it’s no use. Kyuuemon initiates another Kogitsune Ranbu and Lion Ha-Oh falls. Exciting! Pretty good episode. I enjoyed the fun of taking their specialties and really their specific and unique character traits. It would’ve been a lot more fun if they had a whole segment where each of them got someone else’s specialty for a little bit like Takaharu did with Kasumi’s. 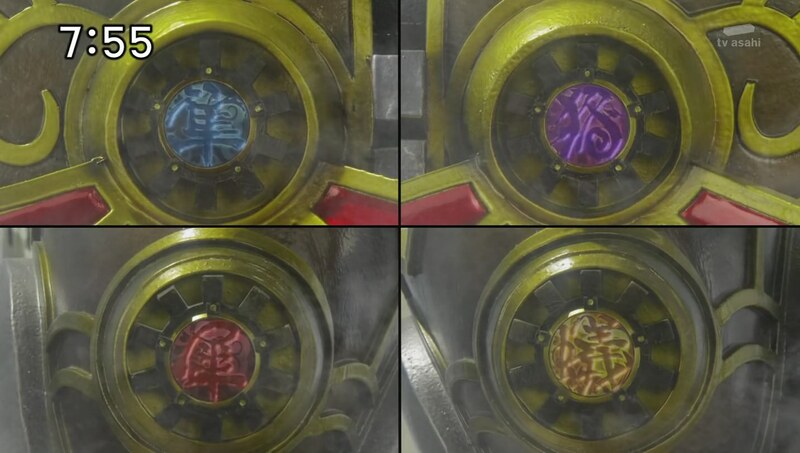 That reminds me of ToQger‘s switch last year with the guys which was a lot of fun. And having characters acting as someone or something else is a Sentai staple I think. So it would’ve been a lot of fun if they went all-out with it here. But I guess the episode was more focused on setting up Kyuuemon’s new toy. And since I don’t read any of the spoilers or toy announcements and such, I had no idea what those gear things were going to be for and that Kyuuemon would get his own OtomoNin. So that was a nice twist for me, even though it shouldn’t be that much of a surprise for another ninja like Kyuuemon to have an OtomoNin, yes? So overall, a good, exciting and fun episode. ← Recap: The Amazing Race 27, Episode 1 – "I'm not a loser!"